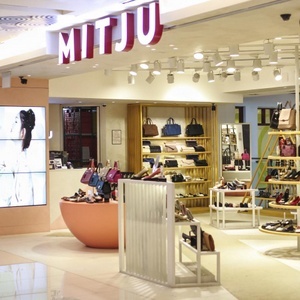 Shoe and accessory store chain Mitju has five locations in Singapore, including a shop at the ION Orchard shopping mall (2 Orchard Turn). Founded in 2005 in Singapore, Mitju is best known for footwear collections with key features of style, comfort, and affordability. A typical Mitju customer is a chic, trendsetting woman with individual style and edge, who prefers shoes with designs that are fun & creative. Mitju’s product lines include women’s shoes (flats, heels, sandals, wedges), customized Mitju Tick Tack shoes, bags (clutches, sling bags, totes, wallets), and accessories (earrings, eyewear, necklaces, shoe accessories). You can check out the entire range of products and product prices at Mitju’s official online store, at www.mitjuonline.com. Design inspiration for the shoes & accessories comes from day-to-day fundamental connections between fashionable and young women. As a fashion advocate, Mitju embraces Japanese virtues of youth, precision, femininity, and ageless design, creating uber-cool, comfortable objects of desire that can be used over many seasons. Also, Mitju emphasizes discovering beauty in the seemingly ordinary, as a form of art and an everyday luxury. Mitju shoes and accessories inspire confidence in women of the world, making customers feel fabulous in their daily lives. The official Mitju Shoes Facebook page is available at www.facebook.com/MitjuShoes. Mitju Shoes Singapore Facebook page is a great place to learn about the latest shoes and for getting footwear style tips.